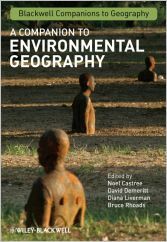 1 Introduction: Making Sense of Environmental Geography (Noel Castree, David Demeritt and Diana Liverman). 4 Biodiversity (Karl S. Zimmerer). 5 Complexity, Chaos and Emergence (Steven M. Manson). 6 Uncertainty and Risk (James D. Brown and Sarah L. Damery). 7 Scale (Nathan F. Sayre). 8 Vulnerability and Resilience to Environmental Change: Ecological and Social Perspectives (W. Neil Adger and Katrina Brown). 10 Earth-System Science (John Wainwright). 11 Land Change (Systems) Science (B. L. Turner II). 12 Ecology: Natural and Political (Matthew D. Turner). 13 Quaternary Geography and the Human Past (Jamie Woodward). 14 Environmental History (Georgina H. Endfield). 15 Landscape, Culture and Regional Studies: Connecting the Dots (Kenneth R. Olwig). 16 Ecological Modernisation and Industrial Transformation (Arthur P. J. Mol and Gert Spaargaren). 17 Marxist Political Economy and the Environment (George Henderson). 18 After Nature: Entangled Worlds (Owain Jones). 19 Remote Sensing and Earth Observation (Heiko Balzter). 20 Modelling and Simulation (George L. W. Perry). 21 Integrated Assessment (James Tansey). 22 Ethnography (Kevin St. Martin and Marianna Pavlovskaya). 23 Analysing Environmental Discourses and Representations (Tom Mels). 24 Deliberative and Participatory Approaches in Environmental Geography (Jason Chilvers). 25 Ecosystem Prediction and Management (Robert A. Francis). 26 Environment and Development (Tom Perreault). 27 Natural Hazards (Daanish Mustafa). 28 Environmental Governance (Gavin Bridge and Tom Perreault). 31 Energy Transformations and Geographic Research (Scott Jiusto). 32 Food and Agriculture in a Globalising World (Richard Le Heron). 33 Environment and Health (Hilda E. Kurtz and Karen E. Smoyer-Tomic).